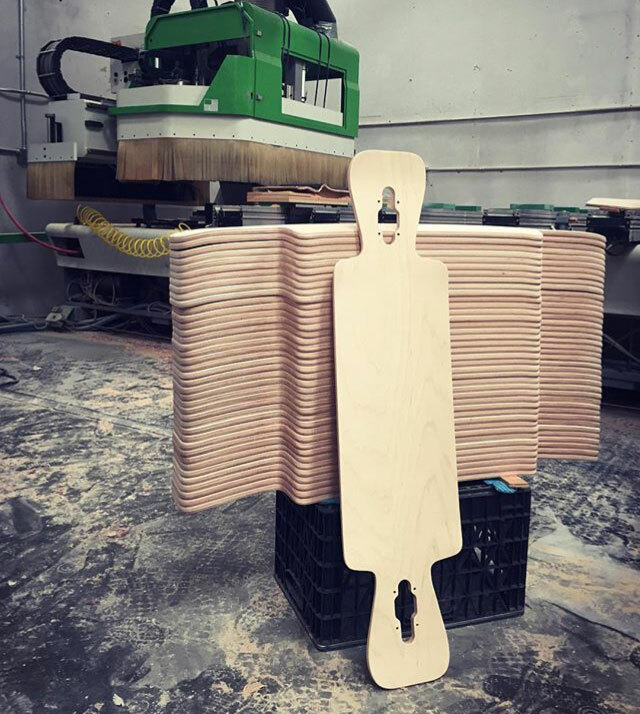 The DK DropKick is a new board we’ve been working on for the last 8 months. We have had many many requests over the years to release a double kick version of our popular Carbon DropKick model. So we finally pulled the trigger and went all out on this one! 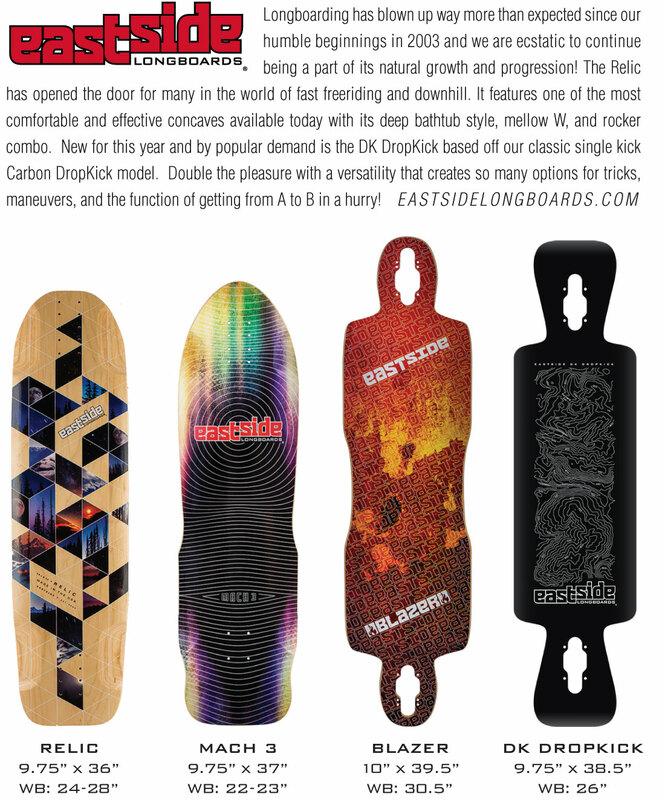 Concrete Wave Buyers Guide Listing for Eastside in 2016 featuring the new board and what the graphic will look like. Once inch of length and wheelbase have been added since this listing was published. Starting from scratch we designed a new mold for this one and ended up changing it several times along the way as we tested and rode each prototype. 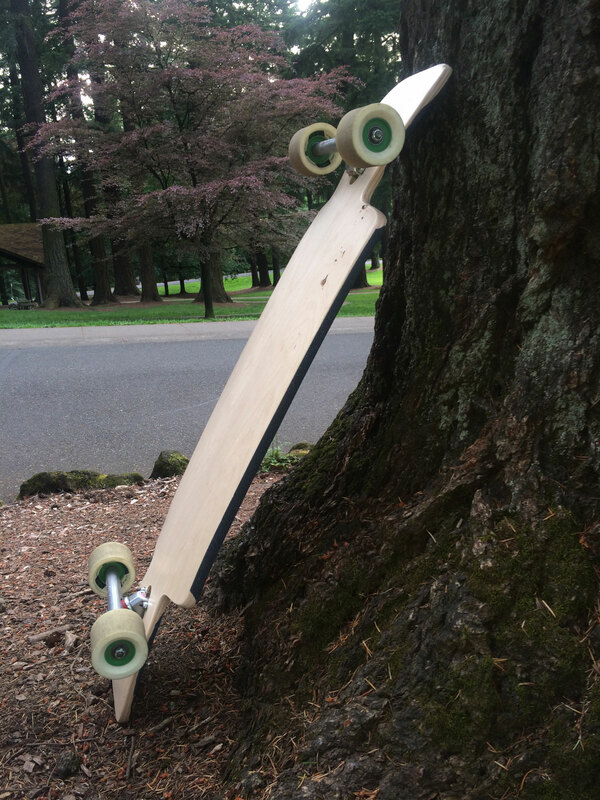 Our focus was finding the perfect wheelbase for such a board. Not too long as to make the overall length too big and awkward to ride. But not too short that an average size rider couldn’t ride without having a too short a stance for freeriding and downhill. A lot of companies have a similarly billed model featuring a drop-through and two kicktails. However many of them have 2 versions to suit either big riders or small riders. One is rather big like a 41-43″ length with a 29-32″ wheelbase. And the other is smaller around 37-38″ length with a 22-25.5″ wheelbase. 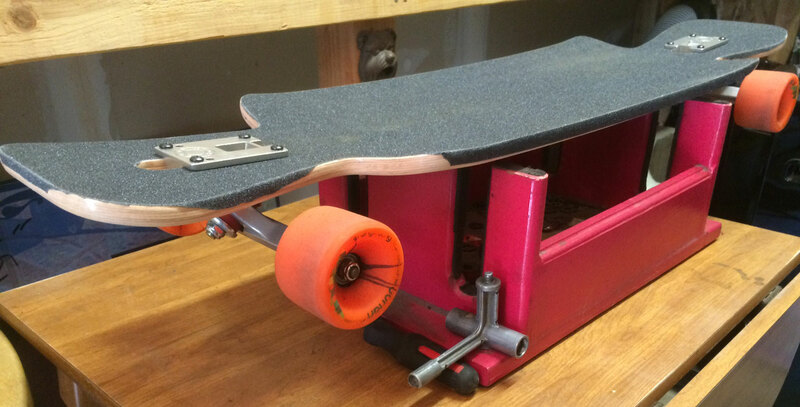 So after making several prototypes, we came up with what we believe has the perfect dimensions for this style of board. It has a 39.5″ length with a 26.75″ wheelbase. It feels just right and not too long when using the kicktails and distance pushing. And it still has enough flatform to let loose with a wide enough stance for some fast freeriding. 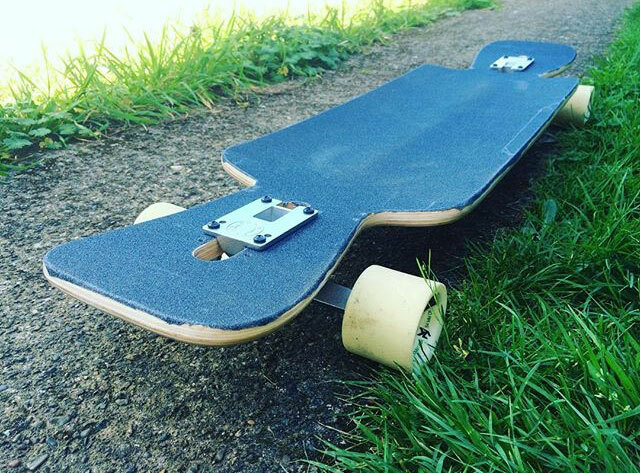 The 23″ EFP (Effective Foot Platform) allows a decent sized stance to stay on the main part of the board and push out slides at speed without your feet coming off. 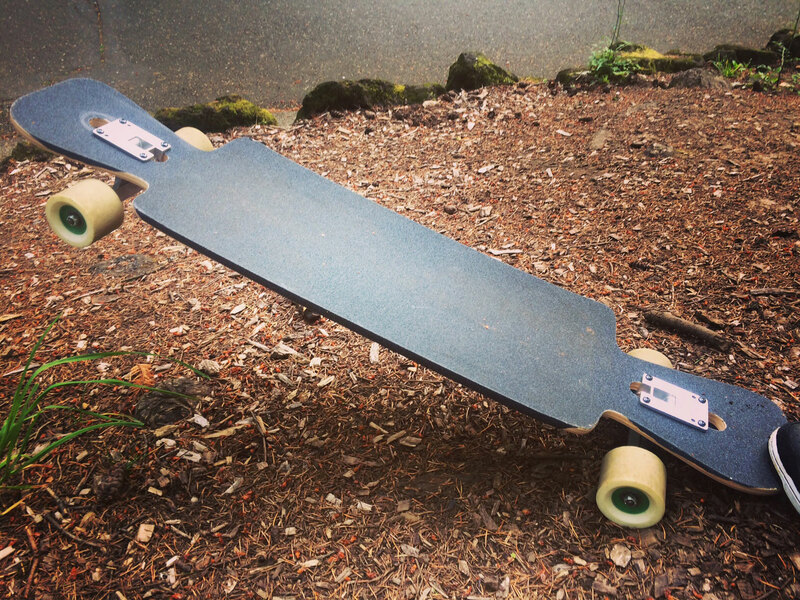 Shot of the killer concave, rocker, and wheel flairs to keep your feet locked. 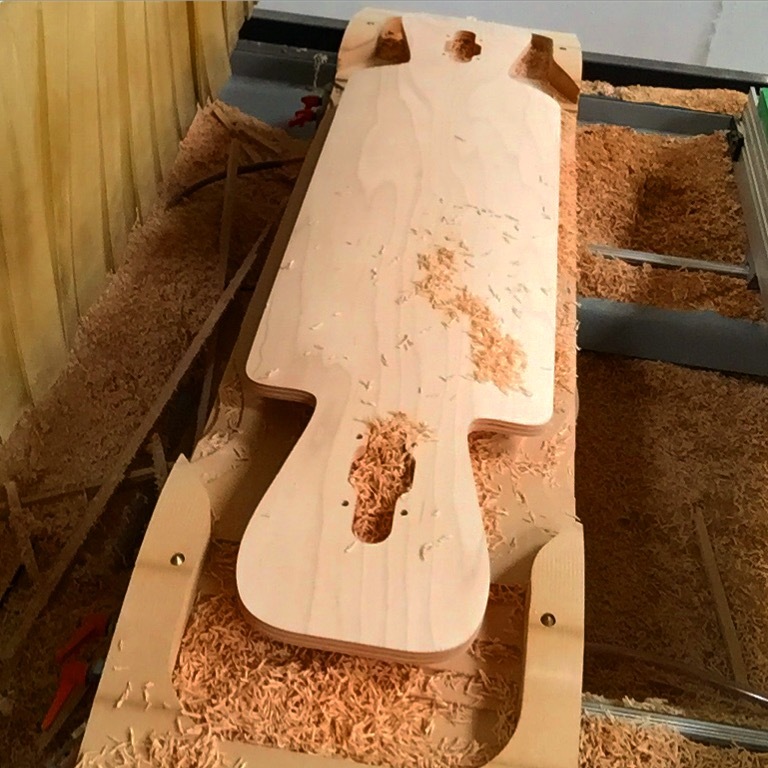 The new concave, rocker, and flairs we put into this new mold are really nice and all together work to hold your feet in a locked position while riding fast and sliding. It also has a slight amount of “W” running down the middle of the concave. This amount is not enough to negatively effect distance pushing, but just enough to add another point of reference for your feet. It also adds some strength to this 8 ply maple board, which keeps it strong but light weight. 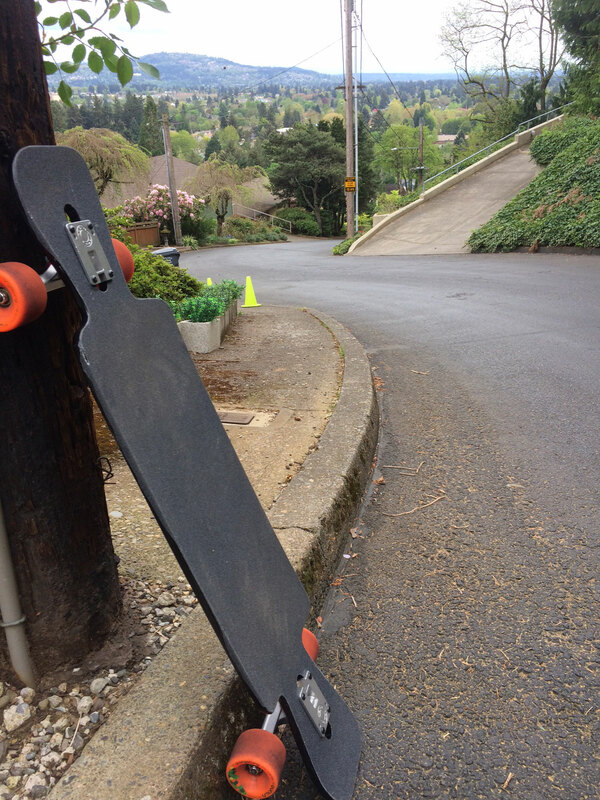 Testing some really steep and demanding hills on the Eastside of Portland with an early proto. We had a lot of things in mind when making this board and really wanted to allow many styles of riding to be had on it. As said fast freeriding and downhill that suits most every sized rider with it’s balanced dimensions. But also as a pushing and commuting board that you can still have a lot of fun on in an area without hills. So yes onto the main feature of this board, the double kicktails! We have tested a lot of shapes and sizes of kicktails over the years since 2006 when the first Eastside DropKick board was released. We found that if it does not have a big enough shape for the foot to fit onto, then it cannot effectively be used as a kicktail. Meaning if its not wide enough and long enough, then the rider won’t use it functionally when they want to. If you look at our shape of tail compared to many other brand’s version of a drop-through with kicktails, you will see that many are an inch or more shorter with too narrow of a shape to allow your foot to use it in a fast responsive way. The way the rider needs proper kicks to lift the wheels up when going off a curb, getting over a big crack, or just having fun doing manuals and tricks. When you are doing all these moves, it’s nice to know that a real size tail is there and you don’t have to look down to see where it is. It doesn’t take long to get used to it and have confidence in moving your foot back (or front foot) on the kicktails when you need it. Riding out manuals on the DK DropKick! Some may say well how strong is it? 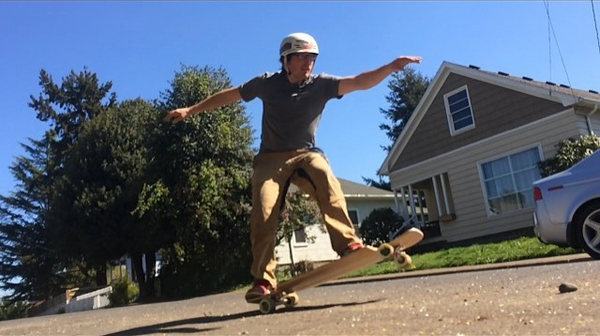 Isn’t having a kicktail on a drop-through a weak point in the design and can break? Yes that is a concern and rest assured we have tried all the possibilities when designing this style of board. One factor is that we found if you don’t have the right amount of rocker in the board, then the kicktails will not be strong enough. We experimented with different types and depths of rocker in the board as well. In this process we also found the perfect size and shape of the tail to have the most control with the most durability. Thus allowing the perfect combination of strength and function. As we changed variables in each prototype we finally landed on something really magical here. Once you step on it and ride it for yourself, you will instantly know and feel it’s powers! We guarantee it will perform better than any other drop-through with kicks and allow you to have fun wherever you are! Stay tuned, we will be announcing the release date shortly. And be running some contests to win one! Lots of testing at our home hill Mt.Tabor in Portland, OR. Early proto with too much “W”. 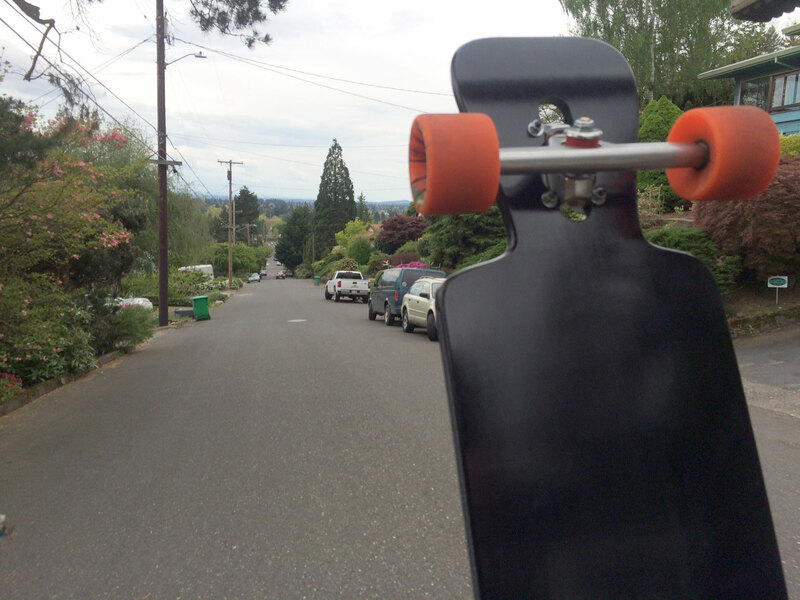 We made it much more mellow to allow riders to push the board more comfortably. Final version with more concave, rocker, flair, and less “W”. More test riding down the Eastside of Mt.Tabor. Freshly cut off the CNC. First round of the production model getting ready to finishing. Graphic featuring a topographical map of the hills surrounding the Portland Zoo. DK DropKick deck. 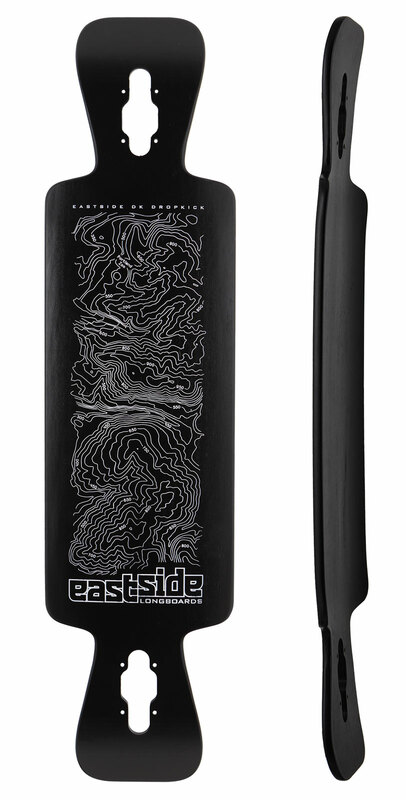 5/8″ radial concave with 0.75″ rocker, foot flairs, and slight “W”. Absolutely love my Mach 3 and Rocky Bomber, cannot wait for this new deck. Please let me know as soon as it’s available! Ok will do thanks for the support! Hey Matt, sorry for the delay here but I’m sure you’ve seen that the new DropKick came out in August. Let me know if you want one and I can hook you up with a deal for all your loyalty! Cheers!